Mark Adams is a mission co-worker with the Presbyterian Border Region Outreach, Frontera de Cristo in Agua Prieta, Mexico, where he has served since 1998. Through Frontera de Cristo, Mark brings together people from both sides of the border, building relationships and understanding. Mark is responsible for introducing the Just Coffee program to Oakland Avenue Presbyterian Church. Miriam and Mark have been instrumental in the development of the ecumenical group called "Healing Our Borders/Sanando Nuestras Fronteras," in which Frontera de Cristo is active. Oakland Avenue Presbyterian Church supports the Adams' mission through prayers, active interest in their programs, selling Just Coffee, and the Missions Committe's annual budget. Bernie Adeney-Risakotta, PhD, came under appointment as a mission co-worker for the PC(USA) in 1991, and he has served continuously since then. Farsijana Adeney-Risakotta, PhD ("Nona"), came under appointment in January of 2003. Click here for a video describing unique aspects of this ministry in Indonesia. Bernie grew up in a mission family in China. He is professor of ethics and social sciences at Duta Wacana Christian University in Yogyakarta, on the island of Java in Indonesia. He teaches ethics, theology, philosophy, and social science in the graduate program in theology at the university. His students are mostly pastors and professors from all over Indonesia. In addition to his duties at Duta Wacana, Bernie also teaches philosophy and social science at the State Islamic University and at the national university (UGM). Farsijana is senior researcher for Duta Wacana's Center for Research and Social Service. In the late 1990s, Bernie and Farsijana built a home in an all-Muslim neighborhood. Their home serves as a center for community outreach and hospitality. It is called "Pondok Tali Rasa," and at any given moment it is shared with several other people of both Muslim and Christian faith. Oakland Avenue Presbyterian Church supports the Adeney-Risakottas' mission through prayers, active interest in their work, and the Missions Committee's annual budget. Elmarie and Scott Parker have served in Lebanon since 2013, Elmarie serves as regional liaison for Syria, Lebanon and Iraq, and Scott serves as Associate for Ecumenical Partnerships. 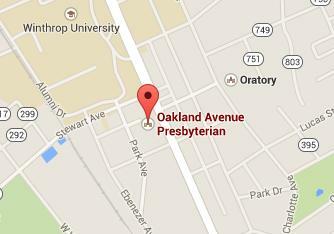 Oakland Avenue Presbyterian Church supports the Parkers' mission through prayer, activie interest, and the Missions Committee's annual budget. Elmarie and Scott will be in the US in early 2019 to visit congregations. You may email them at: elmarie.parker@pcusa.org, or scott.parker@pcusa.org.